Associate and Student members are exempt from this requirement. In the work force, most registered health care workers are required to partake in mentoring. Mentoring can provide support on a number of levels; mentally, emotionally, academically and for business acumen. Many Kinesiologists are in private practice and some work in isolation without support. The AIK Ltd recognizes that mentoring is an essential element to professional support and business success and therefore has introduced this requirement. The AIK Ltd has developed a Mentoring Policy that outlines the new requirements. To access the latest Mentoring Policy please click on the 'Mentoring Policy' button below. Each year registered practicing members are required to receive a certain number of hours per year of Mentoring from a Mentor listed on the 'AIK Ltd Recognised List of Mentors'. A Mentor's Declaration - Form Appendix A (included in the Mentoring Policy) or available as a single-page-download HERE has to be completed by the Mentor and handed to the Mentoree after the Mentoring session. All completed Mentor's Declaration Forms have to be submitted with the membership renewal documents at the end of the year to proof fulfilment of the requirement. *) For an explanation of the various forms of Mentoring please refer to the Mentoring Policy. AIK Ltd Members and non-members alike can apply to become an AIK Ltd recognised Mentor given that certain minimum requirements are met. AIK Ltd Registered Professional Members and members with membership levels above with more than 5 years clinical experience. Holds a Mentoring Training course or similar qualification. Is covered for mentoring under professional indemnity insurance. Please submit your completed Form together with supporting information (qualification, copy of insurance covering Mentoring) to info@aik.org.au. Note: If you currently don't have any Mentoring qualifications, the AIK Ltd has created a mentoring presentation which involves reading the 'Presentation - Mentoring in Kinesiology' and completion / submission of a questionnaire for assessment. This will be of sufficient standard to qualify the individual to provide mentoring services. If you are interested in obtaining your Mentoring qualification that is recognised by the AIK Ltd only please send your email to: info@aik.org.au. Kinesiologists who are not financial members of the AIK Ltd but hold a Kinesiology Diploma HLT51507 or HLT52415 with more than 5 years clinical experience whom have been individually requested by the member to have this Mentor recognised by AIK Ltd NE Board. A Mentor nominated by the Member who is recognised by other professions as a Mentor (evidence of this will be required) or has supportive professional expertise that the member feels would be appropriate for them to nominate as their Mentor (agreement for this Mentor who is not a Kinesiologist is required by AIK Ltd NE Board and the Member – knowledge of Kinesiology would be of an advantage for the Mentor). 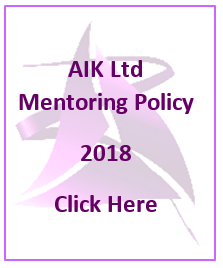 Applies to the AIK Ltd by completing Form 'Appendix B - Nominate a Mentor' of the Mentoring Policy or available as a single-page-download HERE. Please submit the completed Form together with supporting information (qualification, copy of insurance covering Mentoring) to info@aik.org.au. Years of experience and understanding of Kinesiology and operating a clinical business. Understanding of related issues such as how they keep their skills current. Training and experience in professional mentoring. 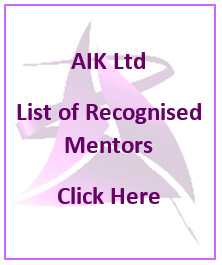 Approved or recognised by AIK Ltd NE Board and on the AIK Ltd Recognised List of Mentors. If you wish to be recognised with AIK Ltd as a Mentor and you do not have existing qualifications as a recognised Mentor then you are able to sit the AIK Ltd Presentation 'Mentoring in Kinesiology' and complete a brief RPL Assessment at no cost. This process will be of sufficient standard to qualify the individual to provide mentoring services to AIK Ltd members. The assessment involves your written response to 8 Mentoring questions which you will have to return to the AIK Ltd for assessment. Once assessed the AIK Ltd will notify you about your result. 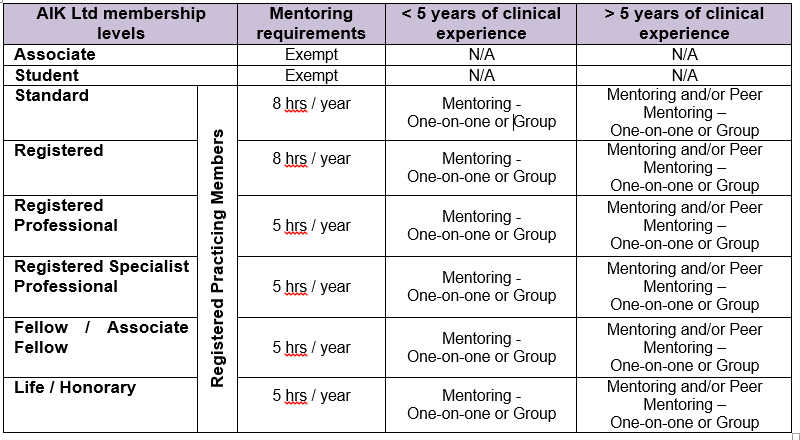 If you would like to undergo the AIK Ltd Mentoring program including Assessment please email AIK Ltd info@aik.org.au.